In May 1987, the UK bus industry was coming to terms with the dual impacts of deregulation and the privatisation of National Bus Company subsidiaries. Outside of London, registration of new vehicles had dropped to very low levels. Most of them were minibuses as companies freed of many legislative constrictions sought new ways to compete for business and also attract non bus users to grow their market. 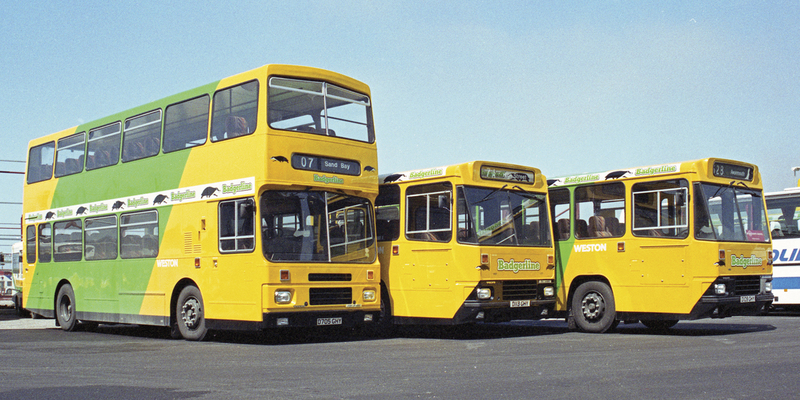 Newly delivered Volvo buses at Badgerline’s Weston Super Mare depot in May 1987. One of those emerging privatised companies was Badgerline, formed from the country operations of the Bristol Omnibus Company east and south of Bristol. It already operated minibuses in various towns but saw a future for quality full size vehicles on its extensive interurban network and for coaching operations. It therefore placed a landmark £3m order for 36 Volvo B10M family based vehicles, 14 single deckers and 12 double deckers with Alexander bodywork together with ten Van Hool bodied coaches, the latter to three trim finishes. All had coach style seating, Volvo THD101GC engines and ZF HP5/500 automatic gearboxes. Not only did this represent one of the first significant post deregulation orders, it also introduced the now more widespread practice of manufacturer lead contract maintenance. Volvo has continued to develop and expand its package concept as Stuart Jones reported in his recent article on their electrification proposals for UK cities (B&CB 1385, 1 July 2016). Recognising the significance of the order, a formal handover of the new vehicles was organised to coincide with the opening of Badgerline’s new Weston-Super-Mare depot, another major investment for the time and reflecting the company’s confidence of their future in the industry. Badgerline chose Sunday 31 May 1987 to launch the vehicles and I was invited to cover for Stuart Jones at the event, probably the first major UK event I had covered in my then occasional support role. It was a glorious spring day and the vehicles sparkled, many in a new, then cutting edge, application of Badgerline’s green and yellow colour scheme. 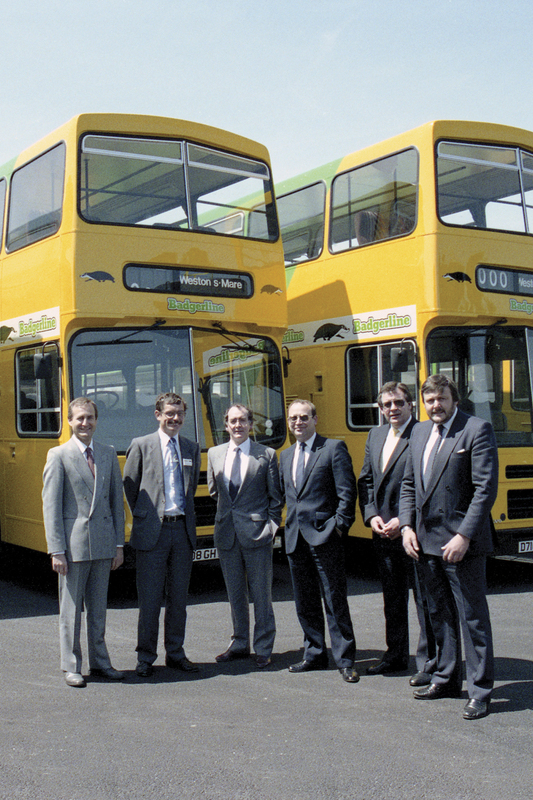 The formal handover of the Volvo buses to Badgerline in May 1987 with Volvo’s Sandie Glennie third from left. The formal handover featured Badgerline Regional Director, Philip Snowden and Volvo Bus (GB) Director and General Manager, Sandy Glennie who described the deal as ‘highly significant.’ The Chairman of Woodspring District Council, Horace Ashman, cut the formal ribbon to open the new depot following which, guests boarded six of the buses for a tour of Weston-Super-Mare. The vehicles were supplied through Kirkby Bus and Coach with Volvo appointing Westward Commercial Vehicles to manage the five year contract maintenance agreement that gave Badgerline guaranteed fixed operating costs over the period. The final paragraph of my report referred to Badgerline demonstrating a forward looking attitude to the industry having been in the forefront of minibus introductions and modern marketing methods. It was obviously a company that was going places but who at the time would have forecast its journey as it grew from being a local operation in Avon through the formation of First Bus to the global operation that First is today. And some of those Volvos have been there all the way! With the exception of the Van Hool coaches which left the fleet early following changes in business focus, the batch of Volvo vehicles led a long service life, mainly from Weston depot. They were stood down from regular work around the middle of the first decade of the 21st Century with some of the double-deckers having strayed as far as Bath and Bristol in later years. Around 2007, six of the double-deckers were upgraded and converted to open top for service in Cornwall, a task most continue to undertake although the impending DDA deadline means 2016 will be the last year that they can be used on registered bus services. One of the single deck Volvos is now in preservation and has recently been restored to original condition. Some 29 years after the Weston-Super-Mare event, a recent holiday in Cornwall reunited me with the final survivors of that Volvo fleet, working on the network of open top services that First provides around the Penwith peninsula in the far west of Cornwall. Realising that this would be their final summer of operation, a day of the holiday was set aside to sample the full Penzance – Lands End – St Ives – Penzance circuit. Taking on a good load at St Ives Malakoff bus station, high above the town’s harbour. The circuit is formed by three services, 1A, Penzance to Lands End via the south coast and 17, Penzance to St Ives via Marazion (for St Michaels Mount) operate on an approximately hourly basis with the 300, Lands End to St Ives along the rugged north coast offering five journeys a day in each direction. The latter normally run through as a 1A to or from Penzance. A short run around the Hayle estuary and the traffic queue towards St Ives was reached at Lelant. Changing in the village centre onto a leather seated Enviro400, Penzance was reached without too much delay despite increasing traffic levels. There was already a queue for the 1A to Lands End which would run through as a 300, the numbers growing as departure time approached and passed. 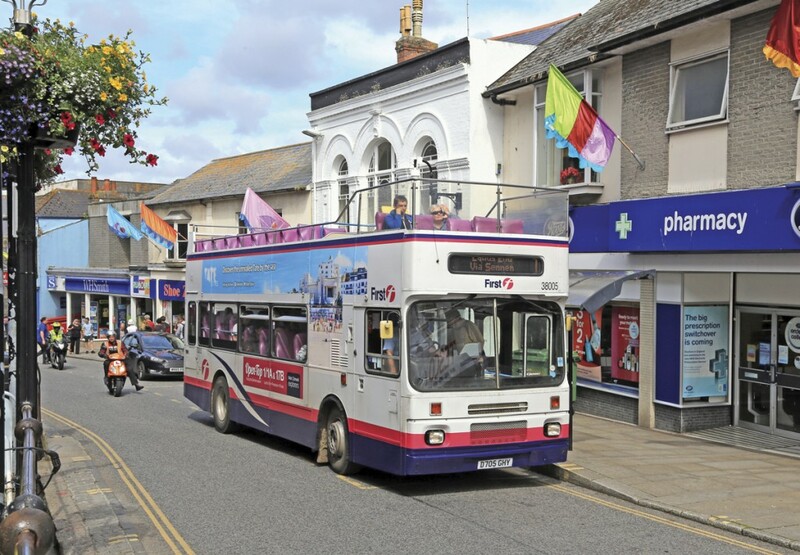 Then a message was received that a number of buses had been gridlocked in Penzance town centre by scaffolding work and deliveries. Well behind time, one of the Citybuses rolled in and commenced loading, the driver offering the best ticket option to those purchasing tickets and again reminding them that the Ride Cornwall day tickets were valid on the trains. The top deck was almost full leaving the bus station and by the final stop in Penzance the driver needed to check for any available space before loading. A tight squeeze passed the inbound Olympian on the way to Lands End. Out of Penzance and once through Newlyn, serious hill climbing started and the melodious tones of Volvo’s 10litre engine echoed from the cottages lining the narrow street. Of course, a hill start was called for whilst waiting for oncoming traffic to make way. It was a narrow squeeze passed an open top Olympian on the 1A in the other direction and on the double run to Porthcurno, there was a German Setra 500 series to contend with. The Citybus emptied considerably at Lands End and changed to a 300 heading for St Ives. 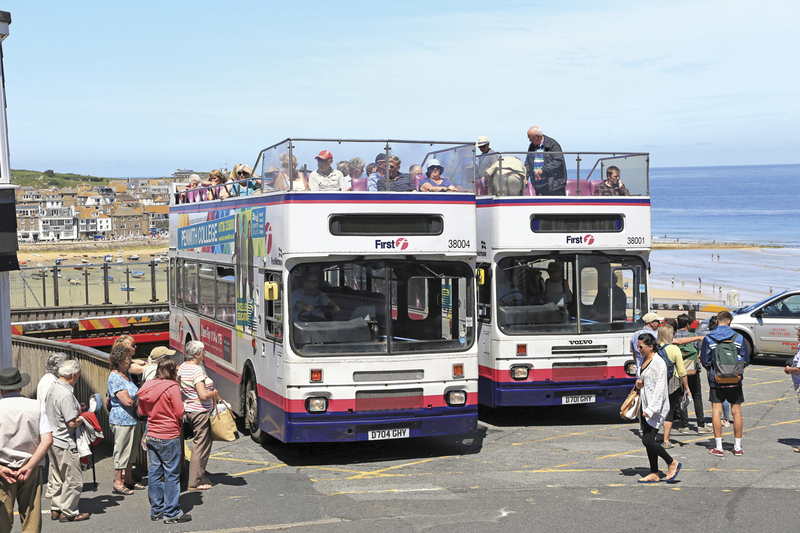 In another double-run, the route dropped steeply into Sennen Cove where a gap between houses on the sea front is reserved for turning the bus. Along the north west coast, the breeze kept it cool on the top deck despite the sunshine and most passengers chose to sit close to the windshields, the views however were fabulous. After St Just, two large camper vans made for slow progress then a First Plaxton Panther coach on driver training duties was caught up and followed most of the way to St Ives. It’s certainly a route where the driver’s awareness of the vehicle and anticipation of conditions ahead is tested to the extreme. At Zennor a local passenger boarded, asking if this was the ‘expensive bus’, presumably this was a reference to the heritage service which has occasionally run along the coast, some stops having signs showing an open top Bristol Lodekka. Loading in Penzance’s main street for a late afternoon run to Lands End. Arrival at St Ives Malakoff bus station, on a ledge above the harbour, reflected the late departure from Penzance, there being little chance to recover time along the route. A few minutes later another Citybus arrived on the direct route from Penzance and, in preparation for their return journeys, both were reversed into place under the watchful eye of the bus station supervisor. Despite the earlier delays, the service was now back on schedule as both vehicles departed on time. My day continued with a quick trip along the widely promoted scenic St Ives branch railway before joining another open topper to complete the Penwith circuit, this time the one Volvo Olympian operating alongside the Citybuses and a mere 22 years old. Highlights were the views from high above St Ives and the coastal sweep through Marazion where the tide had covered the causeway to St Michaels Mount and boats were providing the link as the island’s amphibious bus was later seen undergoing a refit. Following years of cutbacks, First has recently re-established itself as the main provider of stage services across most of Cornwall. Marketed under the First Kernow brand, there appeared to be a good level of up to date information at stops and a comprehensive ‘local bus guide’ with full timetables and map was widely available for the summer season. Shortly after my trip, First announced new branding for Kernow operations alongside significant investment including new vehicles for key corridors and the conversion of a number of low floor double deckers to provide the open top services. The sun didn’t always shine in bygone summers. The open top Leyland Atlantean operating on the coastal service passes through St Just in August 1977. Recognising that even in summer, Cornwall can suffer the vagueness of the British weather, First Kernow has taken a bold move and halved the price of the First day ticket when it is raining. Hopefully this will tempt more people to take a chance and explore by bus, reducing the traffic congestion which is prevalent in summer despite significant investment in the road network since I first visited nearly 40 years ago. 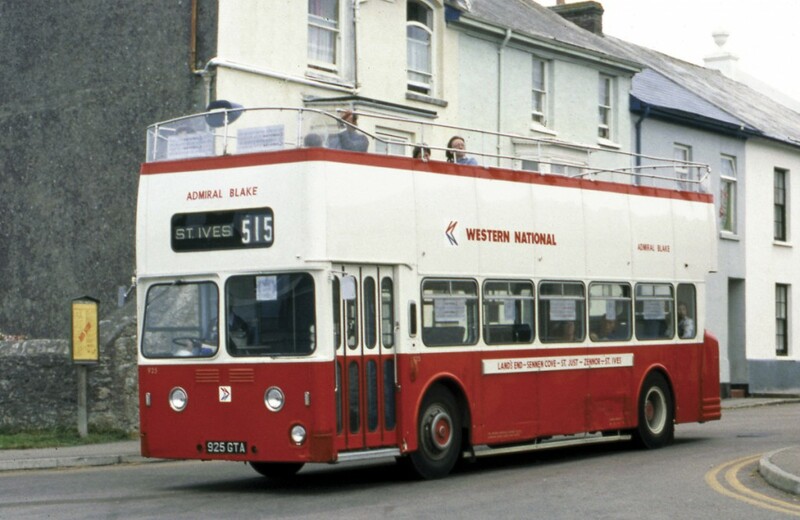 Open top journeys ran along the north coast then under National Bus Company auspices, the ‘elderly’ Leyland Atlantean cascaded from Torquay being a mere 16 years old. Back at that launch in 1987, few would have predicted the growth of the acorn that was Badgerline and probably fewer would have expected to ride on the Citybuses in scheduled service nearly 30 years later. 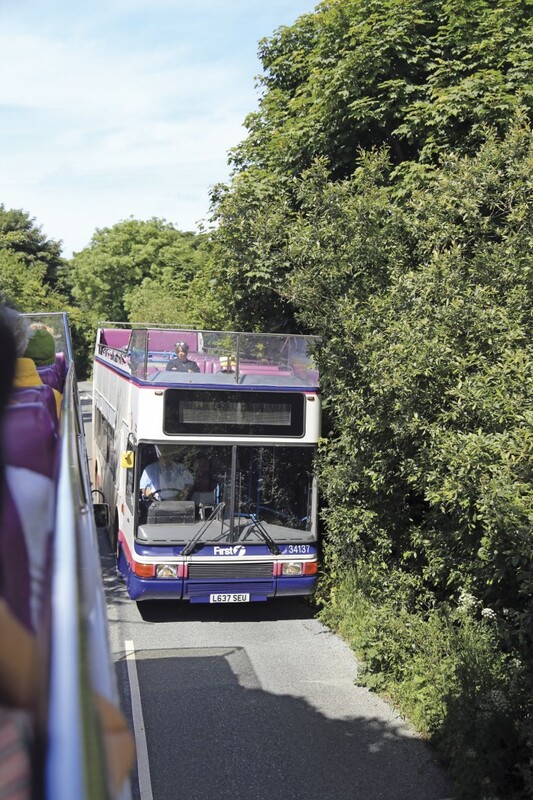 Legislation dictates that this will be their last summer and the summer timetable ends on 17 September, but even without them, the open top journey around Penwith will still be one to savour!